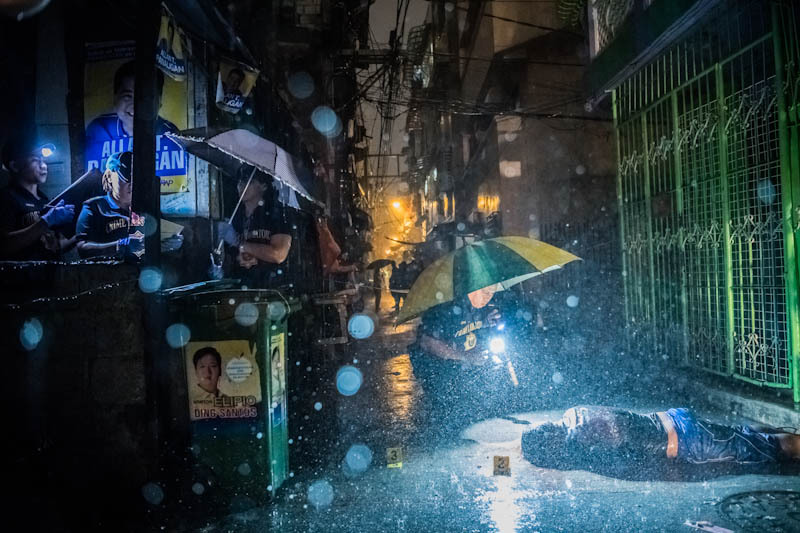 "Taking a Stand in Baton Rouge"
Heavy rain pours as Scene of the Crime Operatives investigate inside an alley on October 11, 2016, where a victim, Romeo Joel Torres Fontanilla, 37, was killed by two unidentified gunmen riding motorcycles in the early morning in Manila, Philippines. President Rodrigo Duterte of the Philippines began his anti-drug campaign when he took office on June 30. Since then, over 2,000 people had been slain at the hands of the police alone. Beyond those killed in official drug operations, the Philippine National Police have counted more than 3,500 unsolved homicides since July 1. The victims, suspected users and pushers, are not afforded any semblance of due process, and are killed just about everywhere imaginable.